The Safari Chair boasts the same design DNA as our OGK Safari Daybed, and is equally polished, practical—even posh. Its minimal, mid-century good looks are only part of the story; it’s also incredibly comfortable. 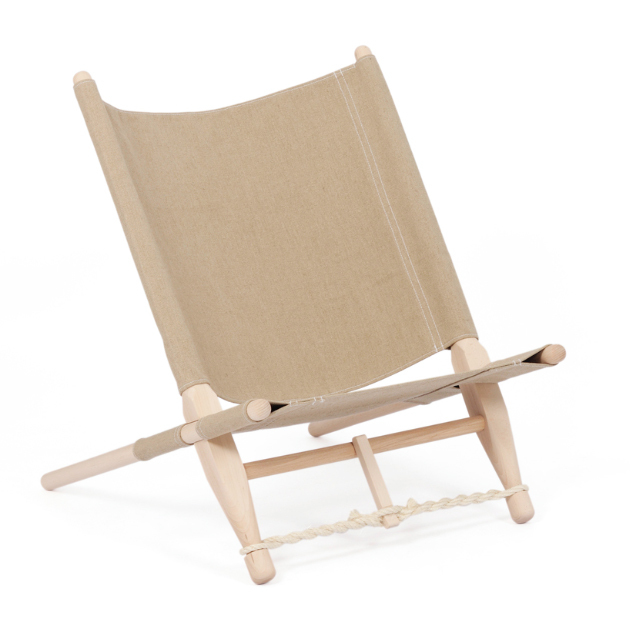 Made of interlocking beech wood poles and linen covers, you can assemble it in mere minutes, no screws or tools required. It comes in a handy bag with shoulder straps should you decide to move it to the backyard or take it with you on a weekend getaway. Offered in two colors, the Safari chair (better yet, a pair) is the perfect complement to our OGK Safari Daybed. Minimal in design with mid-century modern leanings, the OGK Safari Daybed is an absolute knockout. But there’s more to it than mere good looks—visitors to our shop can’t believe how comfortable it is to lounge on. It’s generously proportioned, allowing you to host overnight guests in gracious style, or to simply set up for your own indoor “glamping.” The daybed is a snap to set up. Made of interlocking beech wood poles and a linen cover, you can assemble it in mere minutes, no screws or tools required. It comes in a handy bag with shoulder straps should you decide to move it to the backyard or take it with you on a weekend getaway. Offered in two colors, the daybed pairs beautifully with our OGK Safari Chair. Ole Gjerløv-Knudsen (OGK) trained as a cabinetmaker in Copenhagen and later majored in furniture design from the Danish Royal Academy of Fine Arts. The story goes that the designer felt sorry for his son who was heading off on a camping trip and he didn’t want him to sleep on the ground. 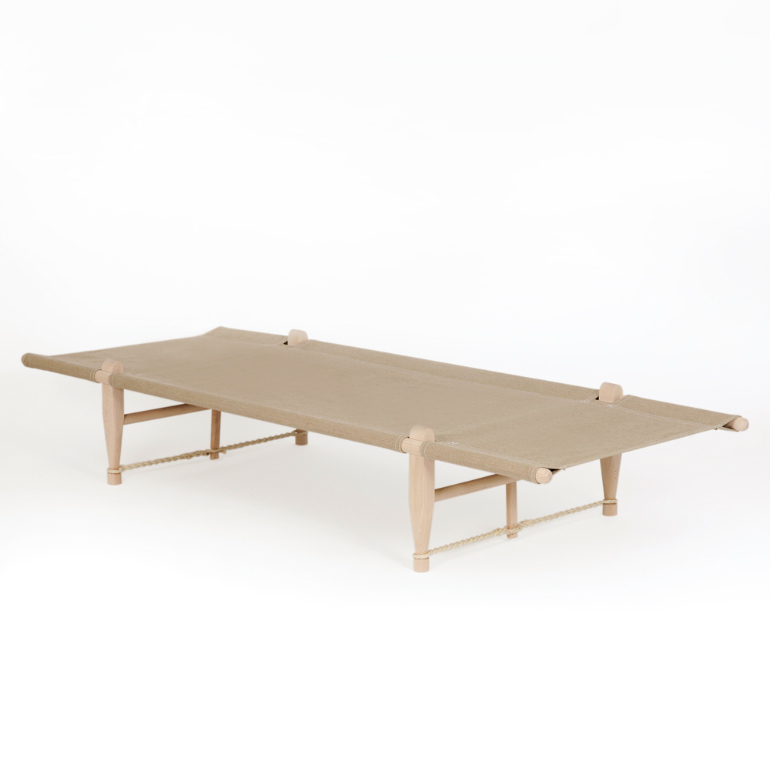 Viola—the Safari Daybed was born! Please be sure to read our return policy before ordering. Minimal in design with mid-century modern leanings, our OGK Safari Daybed is an absolute knockout. But there’s more to it than mere good looks—visitors to our shop can’t believe how comfortable it is to lounge on. It’s generously proportioned, allowing you to host overnight guests in gracious style, or to simply set up for your own indoor “glamping.” The daybed is a snap to set up. Made of interlocking beech wood poles and a linen cover, you can assemble it in mere minutes, no screws or tools required. It comes in a handy bag with shoulder straps should you decide to move it to the backyard or take it with you on a weekend getaway. Offered in two colors, the daybed pairs beautifully with our OGK Safari Chair. 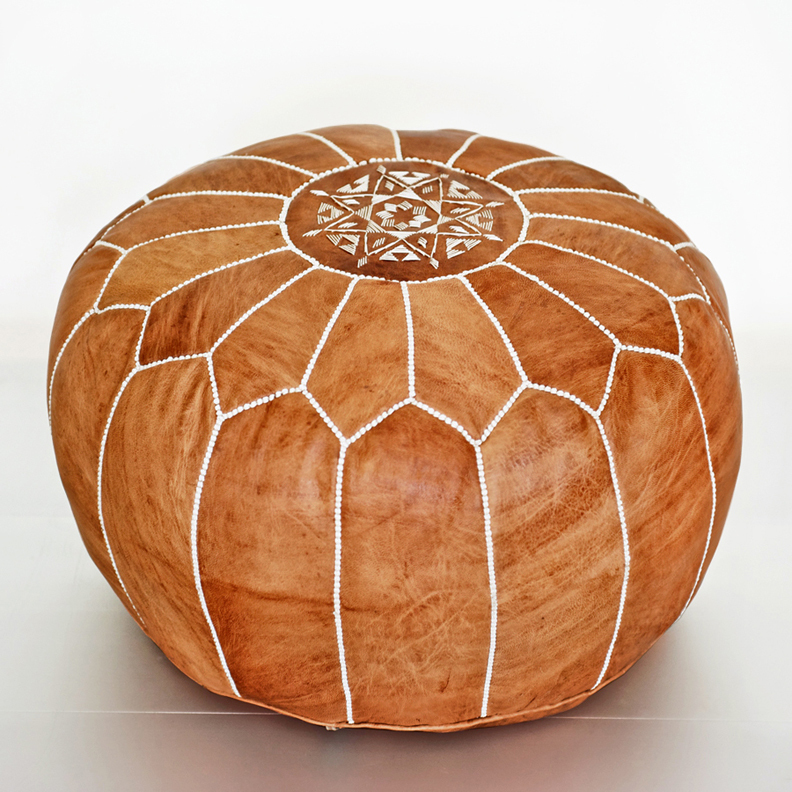 Our exquisitely handcrafted Moroccan leather pouf will lend an exotic flair to your bedroom or living room. Perfect as a footstool or extra seating close to the ground, its simple lines blend beautifully into any setting. Made of genuine full grain leather, each piece is dyed to a classic shade of creamy white and hand embroidered by artisans. No two poufs are ever exactly alike. Stuffed the traditional Moroccan way with shredded wool and cotton, the poufs are very solid and quite heavy, and will stand up to many years of use. An additional $35 shipping surcharge will be added to this item. 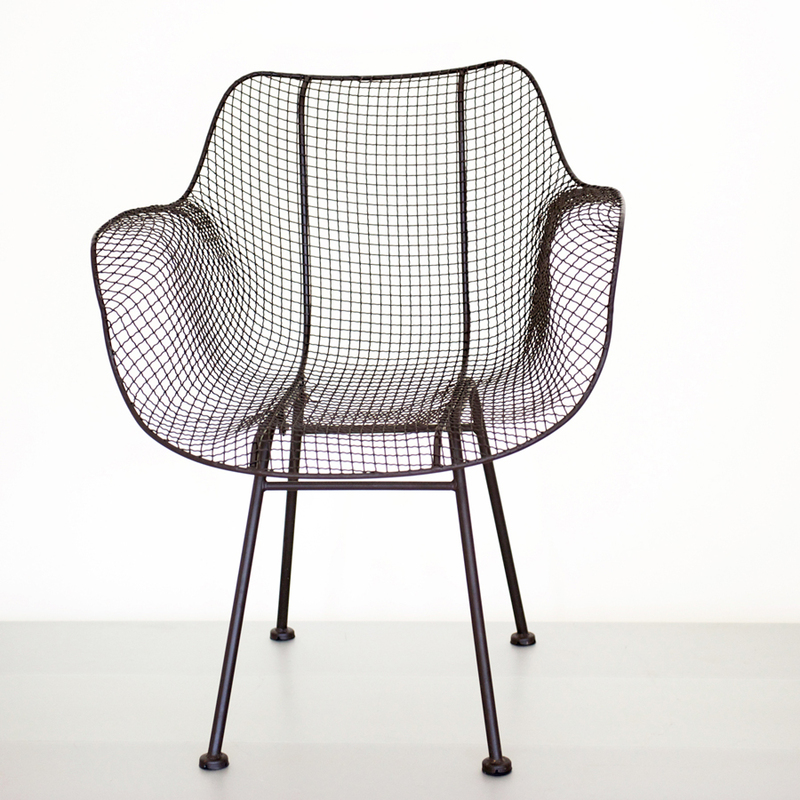 We love this chair’s sleek modern lines and industrial chic design. 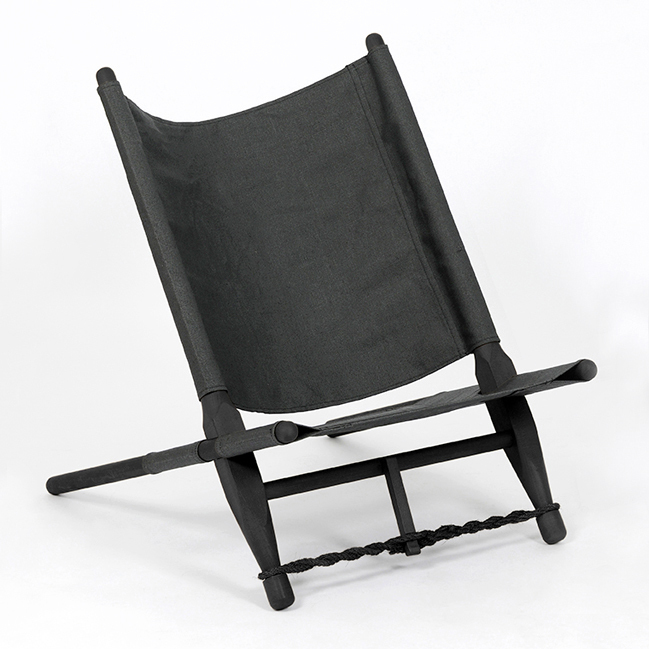 It mixes beautifully with our reclaimed wooden pieces and is amazingly comfortable. In fair weather, we don’t hesitate to pull it out to a porch or patio —a most stylish perch for cocktail sipping and sunset spectating! An additional $35 shipping surcharge will be added to this item. Minimal assembly required (legs have to be attached to seat). 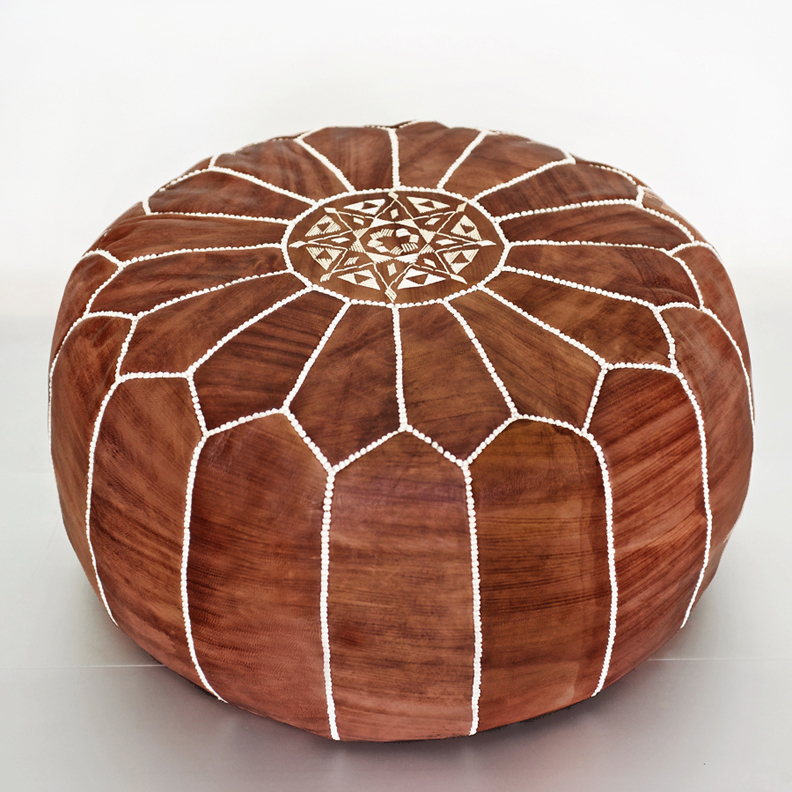 Our exquisitely handcrafted Moroccan leather pouf will lend an exotic flair to your bedroom or living room. Perfect as a footstool or extra seating close to the ground, its simple lines blend beautifully into any setting. Made of genuine full grain leather, each piece is dyed a deep chestnut brown with soft variations in tone and hand embroidered by artisans. No two poufs are ever exactly alike. Stuffed the traditional Moroccan way with shredded wool and cotton, the poufs are very solid and quite heavy, and will stand up to many years of use. An additional $35 shipping surcharge will be added to this item. 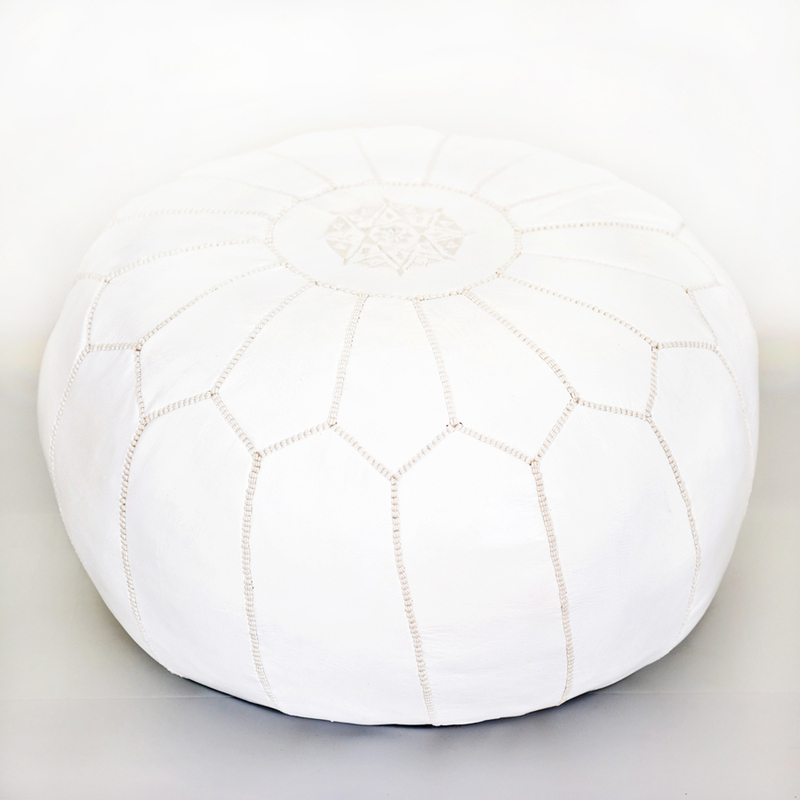 Our exquisitely handcrafted Moroccan “faux” leather pouf will lend an exotic flair to your bedroom or living room. Perfect as a footstool or extra seating close to the ground, its simple lines blend beautifully into any setting. Soulful and sophisticated, the matte metallic finish adds pop and polish—without flamboyant shine—to diverse settings, from traditional to modern. No two poufs are ever exactly alike. Stuffed the traditional Moroccan way with shredded wool and cotton, the poufs are very solid and quite heavy, and will stand up to many years of use. An additional $35 shipping surcharge will be added to this item. 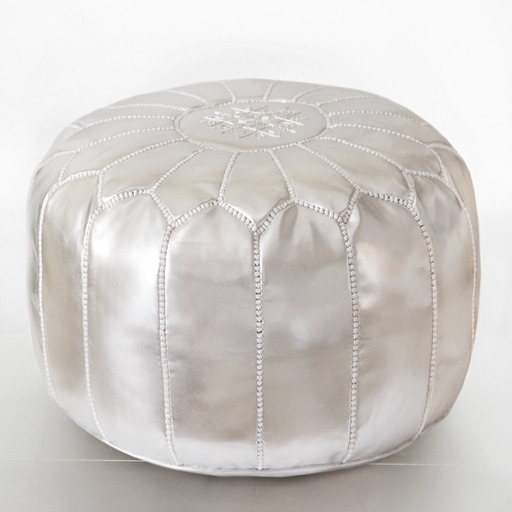 Our exquisitely handcrafted Moroccan leather pouf will lend an exotic flair to your bedroom or living room. 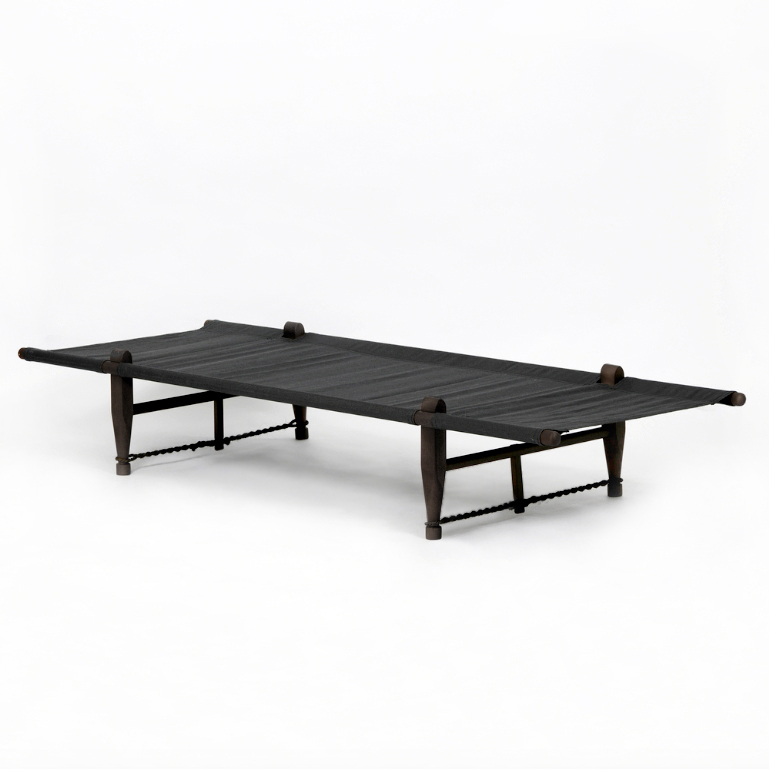 Perfect as a footstool or extra seating close to the ground, its simple lines blend beautifully into any setting. Made of genuine full grain leather, each piece is naturally tanned with soft variations in tone and hand embroidered by artisans. No two poufs are ever exactly alike. Stuffed the traditional Moroccan way with shredded wool and cotton, the poufs are very solid and quite heavy, and will stand up to many years of use. An additional $35 shipping surcharge will be added to this item.